The seacoast's tastiest week is back this spring and we've got your inside scoop on how to make the most of it. After all, when else can you try incredible meals at affordable, fixed prices? One of the culinary capitals of New England, Portsmouth is home to several chefs who were recent semi-finalists for the prestigious James Beard Awards. (Their restaurants, Black Trumpet, Vida Cantina, and Moxy, are all participating in RWPS.) From restaurants with breathtaking water views like Martingwhale Wharf to celebrated steakhouses like Library Restaurant, Portsmouth's booming dining scene is as diverse as it is delicious. Explore all that Restaurant Week has to offer with our guide below. 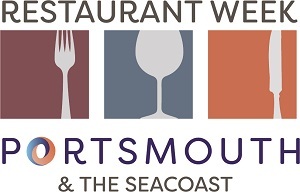 Restaurant Week Portsmouth and the Seacoast runs from March 28- April 6, 2019. Each of the participating restaurants are offering special three-course prix-fixe menus at two unbelievable prices: $16.95 for lunch or $29.95 for dinner per person. More than 40 restaurants around the Seacoast – in Portsmouth, Durham, Hampton, New Castle, Rye, Exeter, Kittery, Maine and York, Maine - are participating. For a full list check out the official Restaurant Week Portsmouth site. They'll also update with each restaurant's RWPS menu as they receive them. Once you pick your top choices, make a reservation! Space fills up quickly for this event. Check #RWPortsmouthNH on Facebook, Instagram, and Twitter to check out trending dishes and restaurants. After dining, share your own photos with #RWPortsmouthNH to help other diners find what's good! Restaurant Week is an incredible opportunity to check out that place you've been meaning to try. Since you're getting a deal, it's also a less risky way to sample new cuisines and flavors you might not normally order. Trying to Keep Cost Down? If part of what appeals to you about Restaurant Week are the deals, beware of add-ons like drinks. Also, keep your eye out for local specials and offers from shops, attractions and hotels in the area. It's definitely possible to make a great stay on the seacoast out of Restaurant Week. Restaurant Week is usually a busy time for restaurants - and their servers! Remember to be gracious in tipping your server. In addition, if you have dietary restrictions or food allergies be sure to check out the menus beforehand. Of course, restaurants will also be offering their regular menus alongside the prix-fixe option, so don't feel stuck with restaurant week promotions.